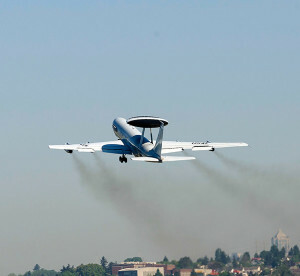 An E-3 Sentry (AWACS), with an upgraded Flight Management System Suite, takes off for a test flight in Kent, Wash., April 20, 2016. The upgrades, being managed by a program office at Hanscom Air Force Base, Mass., eliminate diminishing manufacturing source issues, ensure compliance with current and future air traffic control requirements, and automate the navigation function, allowing for a reduction in cockpit crew from four to three. A recent successful test flight of an upgraded Flight Management System Suite for the E-3 Sentry (AWACS) provides the war fighter with enhanced battle management capabilities. AWACS aircraft provide an integrated command and control battle management, surveillance, target detection, and tracking platform. The aircraft provides an accurate, real-time picture of the battlespace to the Joint Air Operations Center. The upgrade provides three principal benefits to the warfighter. It ensures compliance with current and future air traffic control requirements, giving the aircraft broader access to conduct battle management operations in airspace around the world. It resolves non-sustainable analog equipment with commercially viable digital avionics, replacing 1970s-era systems; and it also reduces cockpit crew personnel from four to three by automating the navigation function. “The cockpit upgrade will make the AWACS fleet operationally ready for worldwide deployments, meeting all the new air traffic management mandates for the ever-increasingly congested international airspace — while reducing the logistical footprint and increasing cost savings,” said Collin Manzo, the engineering and manufacturing development program manager. The test flight took place on April 20 at Boeing Field in Kent, Wash., as part of the Air Force’s CNS/ATM DRAGON, program, which stands for Communication, Navigation and Surveillance/Air Traffic Management Diminishing Manufacturing Sources Replacement of Avionics for Global Operations and Navigation. Officials have said the benefits springboard the AWACS platform into the future while reducing overall system maintenance and sustainability costs. 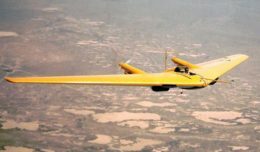 The program now enters the flight test qualification phase to prove out any unique Air Force requirements. Following that, program managers anticipate delivery of modified D1 aircraft to the 552nd Air Control Wing at Tinker Air Force Base, Okla., in May 2017. There, the aircraft will undergo government operation test and evaluation and then production modification for the rest of the fleet, to be accomplished by the depot staff at Tinker AFB beginning in 2018. The CNS/ATM DRAGON program is a cooperative program between the U.S. and NATO. NATO’s first aircraft, known as N1, completed testing in April and is nearing completion of the full EMD phase.